Be an internationally certified Jumping® Fitness Instructor! Like all of us here at Jumping Singapore, we perfectly understand how one can get addicted to jumping. The day is not complete without a good sweat-out on the Jumping Profi mini trampoline. You have become a Jumping fitness evangelist, infecting others with your zeal and enthusiasm, With a spark in your eye, a tune on your lips and spring in your step, you attest to that fact that jumping® fitness has changed you from the inside out. Thank you for being our advocate. We invite you to enroll for our Jumping Instructor Certification Course. You will be trained by elite Master Trainers accredited with the Jumping World Team at Czech Republic. You will undergo a rigorous training program during which you will be instructed and honed to be the best. With the recent rise of several pseudo jumping programs, it is essential to be certified with the original. As a certified Jumping® Fitness Instructor, you will be considered for teaching positions in any jumping centre. You can become a freelance Jumping® Fitness instructor at Jumping® Singapore or any authorised jumping center. 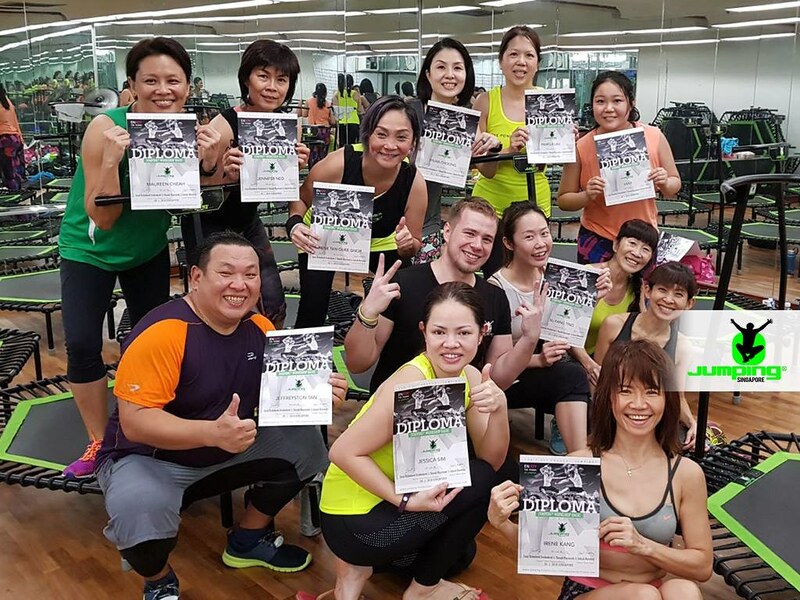 If you own a fitness studio, you can collaborate with Jumping® Singapore to conduct jumping® fitness classes at your business premise, to build a lucrative business, helping many to attain better health and fitness levels at the same time. Upon passing the course, you will be awarded the Jumping® Basic Diploma. This is not just a prestigious addition to your CV, but an open door into the very exciting world of jumping® and jumping® instruction. You become part of the Jumping World Team, qualifying you to conduct Jumping® Fitness classes in Centres located in over 50 countries in the world. You will also be eligible for Jumping® Party Training, Jumping® Kids Training and Jumping® Advance Training. All these are designed to equip and prepare you for a very successful professional fitness career. Jumping® Singapore organizes annual master classes with visiting Master Trainers for Singapore instructors. There is also awesome mutual support and help from our team of instructors. Newly certified instructors have plenty of opportunity to team-teach with existing instructors in studio classes. They will also be invited to conduct demos and workouts in public events. This is to ensure effectiveness in your classroom presentation and instruction. We organize instructors’ get-together every 2 months for a time of fun and sharing. Instructors can learn from each other and from our pioneer instructors who have experienced measurable success in their careers. The course fees is S$500. Register to ensure a place in our next course scheduled for 23rd-24th February 2019.